We live in a highly mobile society. And mobility is not just limited to our multiple digital devices. Individuals and families are actually constantly moving from place to place in our society. About 1 in 6 Americans move each year according to the US Census Geographic Mobility Tables. 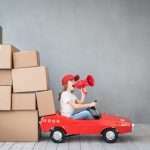 Whether you are moving to college to start a learning curve or moving away from school to finally begin your career, or you’re moving up and changing cities, “Moving” can be stressful. But it doesn’t have to be if you take steps to plan and execute with a rocking checklist. Whether you are moving long distance, just for the season, or you have found the right place for you and your family to settle, whatever the circumstances of your move are, you can systematically focus on what matters by following a few moving checklist guidelines sure to melt your stress away. If you are that 1 that has never moved before, you probably know one or more of the remainder 314,813,229 people move short or long distance, ages 1 and above every year in the US. Perhaps you’ve come to someone’s aid during their transition and noticed their frazzle because they have put off their moving out tasks and responsibilities to the very last minute. As soon as you know you are moving, it is time to start researching your moving options. 1. Who is on your team that you can count on? If someone is making the move with you, cooperate and divide the work so one person is not doing it all. Schedule your tasks, hold regular meetings about your progress. Share thoughts and possibilities. 2. Research moving companies. This is very important. Maybe you won’t go that route because you only have a few boxes and suitcases you can fit into your SUV. But what would happen if your car broke down or you needed more space? Always have a backup plan. Research the companies in your area and the possible scenarios. For instance, sizes, rates, mileage, insurance, wrapping, and boxes. 3. Make a moving budget. How much is the move going to cost you? Detail every expense so you can detail them on your taxes. Every moving company is not made the same. There are companies that offer labor services you can use to help you pack up your belongings, along with the supplies you will need, like boxes and wrapping. 4. Get the boxes you will need in ample time to get more if you underestimated the amount of ‘stuff’ you have. It’s common to see people making two or three runs for more boxes when they realize they have more stuff and it may be too late to have a yard sale. 5. Figure out what you want and need to take with you and what you will dispose of and get rid of. Have a yard sale, out ads on Craigslist with pictures of the items you are selling. Get a printout and post it in your neighborhood library, supermarket, and local moving company. Some moving companies have a bulletin board with flyers advertising items for sale by people who are moving out. Facebook has pages that let you sell your items on a digital yard sale. 6. Plan to have utilities cut off on the day after you move so you will still have AC and running water the day of the move. Pay your outstanding utilities bill if you have one, and give the utilities company your new address so they can send you a reimbursement check if you have a reimbursable deposit. Go to the meters in your apartment or house and take a picture of both the water and electric meters, if you have them. Look at your utilities statement and see how much you spend per day. Call the utilities company, let them know you are aware of your daily consumption so you won’t get an exorbitant bill after your move. If you are moving within the county or city, chances are you will be dealing with the same company. In many cases, the account will remain the same and is only transferred from one location to another. But if you’re making a long distance move, then you need to contact the utilities company you will be signing up with and have them turn on your lights and water before you get there so you can see what you’re doing and take a hot shower after you move into your new place. If you are renting, another consideration is to speak to your Landlord and square away the details so you won’t have any surprises at the end of the day. Whether you are a college student moving out of a dorm or you’re moving cross-country to start a new job, get the details of your lease sorted out and know what is expected of you so you can be reimbursed for your deposit in a timely manner. If that means cleaning your place and replacing anything that is lost or broken, so be it, Get to the task. Create a separate To-Do checklist for moving out. 1. Check that the walls are clean – a little paint over the areas with the most traffic may not be a bad idea. Some landlords require that you return the property in the same condition which includes the same color on the walls. So if you have a psychedelic taste and painted the walls orange purple and red, make sure there won’t be a surcharge to your name for bringing them back to white after you move out. 2. Check the yard. If it is not mowed, plan when you will mow it so it is not a reason to hold back your deposit check if the lease says it’s your responsibility to keep it mowed. 3. Check bathroom fixtures, windows, and doors for any type of damage. If there is any damage that is not your responsibility to fix, check the wording of your lease and make sure the landlord is not going to come after you for repairs money. 4. Check the carpet cleaning and general cleaning guidelines in your lease. 5. Make sure to return the keys. Check with the landlord to see how this can be done and follow through. 6. Check the guidelines of your Residential Association ahead of time. You might have to give them the date of your move and rent the pads to place over the elevator walls if your building doesn’t have a service elevator. In some cases, moving is only allowed during certain days and hours. Schedule your move ahead of time your RA and make sure they are aware of your moving day and time and approve of it, this includes access to the service elevator if there is one. Being proactive will save you time and money. You can never over plan. As mentioned before, your rental deposit reimbursement may be at stake. Taking a few proactive measures will make your long distance or local move more successful even if it means carrying out a few menial tasks. We already mentioned utilities, but there are more services than just utilities that you must consider. How many of these services do you have and how do you need to treat each account before the move. Do you want to transfer or end the subscription to them? In some cases, the same services you have in one geographic location are not available at the same rate or offered by the same company in another. You may have binding subscriptions that you will need to end or transfer. Calling each one of the companies that you subscribe to for these services and going over the rates and transfer or shut down requirements can be hectic if you leave everything for the last minute. Space out your tasks so you can breathe deep in between and never lose your peace of mind. Take notes next each of these services outlined below and refer to these notes in future calls. Make sure you take down the person’s name and their position within the company y so you don’t have to start from zero when you call again. If you have other services you subscribe to locally and need to cancel and turn them off on or before the day of the move, include them on this list and schedule their cancellation. These may include getting your clothes from the dry cleaners, calling your dentist, hairdresser, o dogwalker, to cancel an appointment. Calling your friends and family and asking them to help out ahead of time will lower the chances that they will have conflicting schedules. However, if there is no one to help you on your move, you can get cheap labor if you plan ahead. For example, at many moving companies, they also provide labor, as we mentioned before. There are other types of labor finder services you can tap into in the neighborhoods where you will be moving into and out of. Make sure they are legitimate, find online reviews, ask friends and family for their advice. Many types of arrangements can be made by contacting local churches. There may be a local program to help high school students complete community service hours to graduate that you can tap into to help make any long distance or local move a successful one.